Modeling is a career where appearance is of paramount importance. 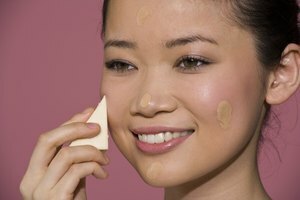 Because many models are between the ages of 15 and 25, when hormone levels are fluctuating the most, and because the heavy cosmetics, bright lights and stress some forms of modeling require can wreak havoc on the skin, preventing blemishes can be a concern for many models and hopeful models. Models use their appearance to convey a message and encourage people to buy the product that they are selling. Models may appear in person, in showrooms or fashion shows, or in print, in posters and magazines. A model's appearance, including skin quality, plays a role in how successfully you can convey your message. There are several different kinds of models. Fashion models, also called editorial models, are the best-known. These models---like Kate Moss and Adriana Lima---appear in magazine fashion spreads and advertisements. Because photos can be edited, minor skin problems are not usually detrimental to fashion models. Runway models, who walk in fashion shows, may also work as fashion models. Runway models are usually viewed from a distance so some minor skin problems might be OK.
Commercial models, who appear in catalogs and ad campaigns, often have the strictest skin requirements since there are many more commercial models than other kinds of models. Given a choice between a model with perfect skin and a model who has skin problems, an agent will usually choose the model who needs the least post-production photo editing. Body models, who model hands, feet, arms or other body parts, only need perfect skin on the body part they plan to model. Clear skin is not required for modeling, but it is an advantage. In general, female models should be at least 5-foot-6 or taller for commercial work and 5-8 or taller for fashion and editorial modeling. Men should be at least 5-9 to model in commercial or editorial campaigns. Models, particularly fashion models, are usually very thin, since they need to be able to fit into designer sample sizes. Commercial models can weigh more than fashion models. There are several reasons perfect skin can be a benefit to a model. For beauty and cosmetic campaigns, clear skin is essential. Models who do not have perfect skin are unlikely to be booked for these campaigns even if their photos could be touched up. Post-production photo touch-ups can be costly, and many people are unwilling to spend the money required on a new model when they could book a model with clear skin instead. Established models who have made a name for themselves in the industry are more likely to be able to get away with skin problems. Perfect skin also helps a model stand out at go-sees and castings. It can be hard for agents to see past imperfections, even if they could easily be covered with makeup or in post-production. Hopeful models who are worried about the quality of their skin should visit a dermatologist. 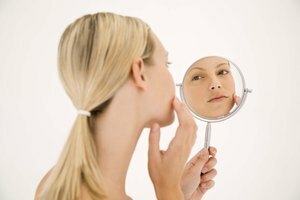 Many treatments can prevent and minimize blemishes, as well as treatments that can clean up acne scars. L., Holly. "Do You Need Perfectly Clear Skin to Become a Model?" Synonym, https://classroom.synonym.com/about-5484932-do-clear-skin-become-model.html. 07 August 2017.